If you are somewhat new to going green, or are just beginning to dabble in homemade and non-toxic cleaning, you may be a little overwhelmed about where to start, what products to use and where, and how to get rid of toxic cleaners from you cupboards once and for all. The thing that I love the most about homemade, green cleaners is how simplified my cleaning cupboard, and cleaning routine in general, has become. Gone are the days of needing a separate cleaner for each different job, and each different room – kitchen cleaner, floor cleaner, bathroom cleaner, tub & tile cleaner, toilet bowl cleaner, window cleaner, dusting spray, multipurpose cleaner – these can all be replaced by a few basic products that you probably already have in your kitchen cabinets or somewhere around your home. To create simple, green, and frugal cleaning products, I have found that the following 5 items are the ones that I use the most, are the most multi-tasking, and the best performing. This is probably the most frugal and versatile non-toxic cleaner. It is a safe and natural disinfectant that, mixed in a 1/1 ratio with water, can clean everything from floor to ceiling in pretty much any room, including mirrors and window. You should not, however use vinegar on porous natural surfaces like marble or granite. I use vinegar to clean my kitchen counter and floors, and wipe down cabinets (although that doesn’t happen very often! ), it’s great at cutting grease. I also use it to clean my bathroom, it’s especially good at cleaning up stainless steel fixtures and making them shiny. The vinegar and water mixture is also works as a stain remover on carpets and rugs! Some people, like my hubs, have a hard time with the smell of vinegar. I find that the scent disperses pretty quickly, especially with a fan or window open. But, you can also try adding essential oils to your vinegar and water mixture to achieve a scent that you can live with, and maybe even enjoy! You can also use vinegar in the rinse aid compartment of your dishwasher instead of a commercial brand like Jet Dry. It helps to keep residue off dishes and keep them spot free. Vinegar is also a great replacement for fabric softener in you laundry. Add it to the fabric softener dispenser, or fill an old Downy ball with vinegar. While it doesn’t leave a scent like store-bought fabric softener does, it does help to repel static cling, and I have learned that I like the smell of just plain clean, and that artificial scents are actually irritating to me now. This is an essential replacement for abrasive toxic cleaners like Comet. You can keep it in an old Parmesan cheese container, or other type of shakeable container so that it is easily accessible for cleaning. 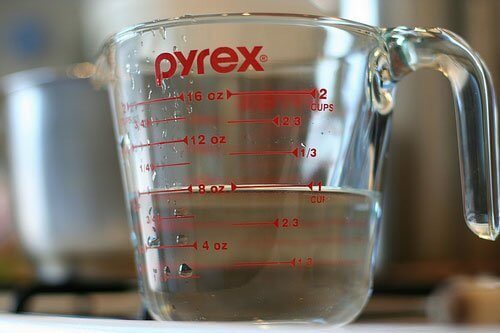 Use it alone, or make a paste by mixing it with water, it is great for scrubbing off all different types of surfaces. I pretty much exclusively use Baking Soda to clean my toilets. Just a few shakes around the bowl and a good scrubbing with a toilet brush and we’re good to go. It’s also great for scrubbing off burned on food on my glass top stove, cleaning and whitening my white enamel kitchen sink. Sprinkle baking soda on your rug or carpet and wait a few minutes and then vacuum it up for a natural freshener and deodorizer. This is especially nice if you add a few drops of essential oil to your baking soda, it adds a lovely scent to your home as you vacuum. Hydrogen Peroxide is great for cleaning areas that you want to be disinfected. It breaks down when exposed to light, so it’s best kept in an opaque bottle. I leave mine in it’s original bottle and add a spray nozzle from a cheap dollar store spray bottle. You can mix hydrogen peroxide 1/1 with water to stretch it even further. Spray down surfaces in the kitchen and bathroom with hydrogen peroxide to disinfect and kill germs. It’s not the best cleaner in the world as far as actually scrubbing and cleaning, but I like to use it on my kitchen counters after I have already wiped them clean, just to make sure they are disinfected. The mix of hydrogen peroxide and water also is great at removing certain types of stains on clothing. Dark stains, like blood, blueberries or other berries, or juice, come out easily when you spray them before putting the clothing in the wash.
Castile Soap has many uses for both cleaning and as a personal care product. Along with tea tree oil and water, it makes up my favorite homemade multipurpose cleaner. Just add water to a spray bottle and add a few quirts of castile soap and a few drops of tea tree oil and you have another multi-tasking cleaner for all around the home. This multipurpose cleaner is a great alternative if you don’t like the smell of vinegar, because it is just as versatile. I use it whenever I’m cleaning around my hubs, and for cleaning and dusting in my living room. This is just one more great multitasking cleaner that is, obviously, excellent at cutting through grease. Not just for washing you dishes, you can dilute it with water in a spray bottle to clean pretty much any area of your kitchen. It’s great for cleaning out your sink and washing down counter tops. A spray bottle with dishsoap diluted with water (actually mostly water and a few squirts of dishsoap) makes an acceptable laundry stain remover. While it doesn’t work for some stains, like grass or dirt, it is good on food based stains and those annoying little grease spots that are hard to get out of clothes. Keep a bottle handy in your laundry room along with the other natural stain removers we’ve been talking about here the past few weeks. :: I have to mention one more product that finds it way into several of my homemade cleaning products, so an Honorable Mention goes to Tea Tree Oil. TTO is a natural antiseptic and disinfectant and is great to add to homemade multi-purpose cleaners. I also use it in my cloth wipes solution, as well as when I make homemade disinfecting wipes (like reusable Clorox wipes). Those are the basic items that I use for cleaning all around my home. 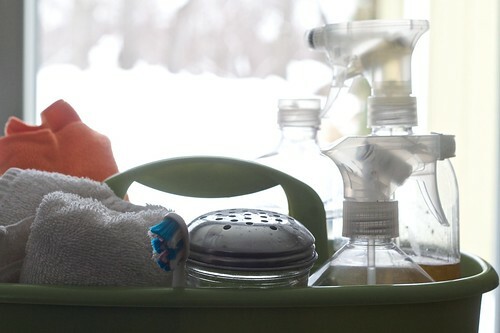 What are your top green and frugal cleaning products? This is a great post! I have been doing so much in my home to stay away from toxic cleaners. I love it that these options are not only very inexpensive but green and healthy as well. You can’t beat that. I thinks sometimes commercial cleaners give the appearance that they work better because they have all those foaming agents in them but I really don’t think they do! This is great! Thanks for the green, eco-friendly, frugal post! Are there any particular natural dish soaps that you recommend? @Kristin, I’m not sure what Emily would recommend, but I personally like Ecover and Seventh Generation best. I’ve tried others, like Biokleen, Trader Joe brand, Nature Clean and a few others, and I find they just don’t cut grease well enough or I have to use way more soap to really get things clean. I would second Stephanie’s recommendation of Seventh Generation for a natural dish soap. The only other one I have tried is Meijer (which is a grocery store in the Midwest) Naturals and did not like the way it worked. I have also heard good things about Mrs. Meyer’s, but have not tried it myself. Hope that helps! I have used all of the above mentioned. My only question is: Do you find that when you use vinegar/water and an essential oil when cleaning mirrors that streaks show up after a bit? Like maybe an hour or so after cleaning the mirrors? I have been attributing that to the essential oil. The only reason I used the essential oil was because I like the smell. I don’t dislike the vinegar smell as it goes away rather quickly, but I just liked the essential oil smell. I was trying to use only one solution to clean and with the exception of streaks on the mirrors it has been working. For the mirrors I have been using just water and vinegar. Thanks for the post I really enjoyed it. It good to see others that use the same as I do and don’t think I am crazy or my house is less clean than theirs that is cleaned with commercial cleaners! @Julie, I don’t know what Emily would say, but I just use plain vinegar and water without the essential oils. Yes, it smells like vinegar at first but the vinegar smell goes so quickly that I don’t worry about making it nice smelling. I add essential oils to my other cleaners instead. When I clean my mirrors, I use a microfibre cloth or my favorite Norwex glass/mirror cloth, together with the vinegar/water and that does a really good job. You know, when I tried to add essential oils to my vinegar and water mix I felt like it left kind of oily streaks on some things I cleaned like my bathroom sinks and mirrors too. I no longer use essential oils in my vinegar and water cleaner and just use it when my hubs isn’t around. 🙂 And, like Stephanie, I also use a microfiber cloth that is specifically for glass and mirrors. What brand of natural dish soap have you been happy with? It seems that some don’t really cut grease all that well. You can also look at Stephanie’s and my replies to the earlier comment, but it sounds like we both recommend Seventh Generation, and she also recommends Ecover. I also have heard good things about Mrs. Meyer’s but haven’t tried it myself. I am a big vinegar user for cleaning. I have also been using borax but plan on weeding it out and only using baking soda (just one less thing to buy). If you have problems with streaky mirrors wipe down with alcohol (to remove all the build up from commercial cleaners) then use the vinegar and it should wipe clean. Love my abundance of vinegar and baking soda- just can’t go wrong with it. And you can get over the smell for a little safer greener cleaning. 🙂 Vinegar is a natural antibacterial cleaner also. Thanks for all the tips. I always wondered why they always sell hydrogen peroxide in those brown bottles – who knew it broke down in the light? I add lemon essential oil to baking soda in a parmesan cheese container. I use it daily to clean my sink. If I have over-sprinkled, I do a quick spray with lemon vinegar and wipe dry. My sink shines! I am interested in using these natural cleaners but I have granite and marble in my kitchens and baths. Any suggestions on what I could use? I think that dish soap, hydrogen peroxide, and castile soap should all be safe to use on granite and marble. You just want to make sure you avoid acidic products like vinegar and lemon juice. Hope that helps! Thank you Emily! I’ve read many, many articles about green cleaning at home, but this one is perhaps the best. It’s informative but concise, with simple suggestions that will give any home green cleaner the information they need to get started. Bravo! THANK YOU! for such a great post. I went and picked up some castile soap and vinegar today and am getting down to business. Next on the list, freecycle all those left over cleaners that I no longer need! 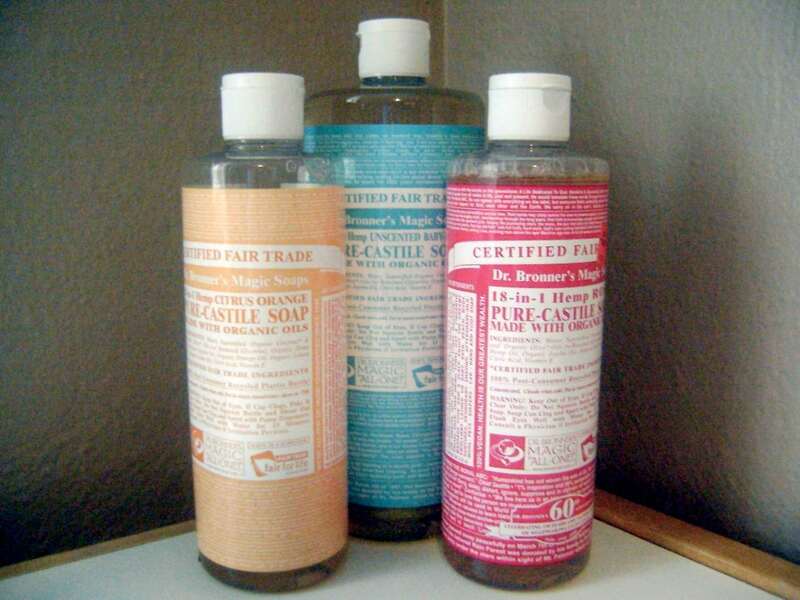 Quick questions – For the castile soap all purpose spray, how do you use it to dust? Just spray a light amount and wipe down? Or spray on a cloth and dust? Also, do you need to wipe/rinse it off of counters, floors, etc? I am so excited to get started! Question though, for the toilet specifically I’m really in a rut with using bleach. We have a tiny toilet with no windows and its just a few feet away from the kitchen with only one door between and it can get really stinky. I’m pregnant and that room has become my nightmare room as I feel I could throw up and need something to clean the bottom and to keep fresh smelling – HELP!!! I have been using green recipe cleaners myself for several years but I have to admit, with working full time, I have someone come in and clean every two weeks. Are there Spanish translations of these web pages? I feel so bad for these Hispanic women who are exposed to 10X the chemicals in cleaning other people’s homes. I have been providing my house cleaner with safe products from Whole Foods which are usually labeled in Spanish, but i would like to switch to less expensive home made products to cut down on all the plastic packaging, too. Any suggestions?